January, a time of diets, resolutions and bad weather. It can be a pretty dull month. But not with a Brian Alfred tax rebate! If you haven’t already submitted your 2014/15 self-assessment tax return (SATR), then now is the time to do so! We’re bringing in 2016 in style! If you submit your SATR with us in January, you could be lucky enough to pay NO FEES. That’s right, zilch, zero, absolutely ‘nowt’. The full rebate is yours to keep. All you have to do is get your rebate through Brian Alfred in January and your name will be put into a prize draw. The winner will be chosen at random and will receive a cheque in the post for a whopping £345! 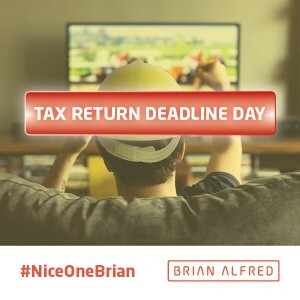 So, all of the hard work we do to get you the best rebate possible will be completely free of charge… that is definitely worth a “Nice One Brian”! What’s this about a deadline? If you didn’t know, all self-assessment tax returns must be submitted to HRMC before 31/01/16 and with penalties for late submission starting at £100, you can’t afford to miss it! There’s no better time to submit your tax return. Simply download our tax pack and send it back to us before 28/01/16. Once we’ve received it, we’ll process your claim and pay you in just 24 hours!